Saturday was a fun day… a great day for me. 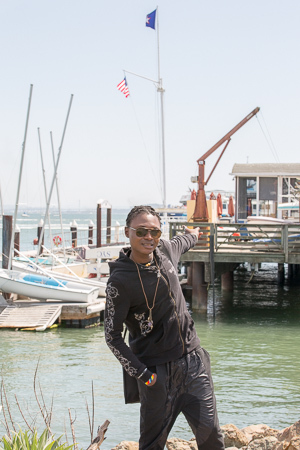 Junior, the only client we have who doesn’t mind being publicly identified, and I brunched at Spinnakers in Sausalito and then walked around the main street taking in the sights. I was able to take Junior on his first trip across the Golden Gate Bridge and share his first reactions to the views and gestalt. Wonderful! We came back into the city, and later met up with a Tunisian seeking asylum, a Tunisian who has been granted asylum, and my husband (who works with the Tunisian asylee). It was a relaxed, happy day. Which got me thinking. Much of what the Guardian Group talks about is needs, problems, and the housing crisis. All those issues are real and pressing, but I need to explain that meeting our clients, learning from them, and feeling proud of their successes is selfishly rewarding. Completely a high. So far we have helped/are helping 11 people settle in the Bay Area. Some folks we have provided ad hoc, limited-term support. Others we have an on-going friendship with, even when they do not need support. I want to share a list of our clients and my take on their current situation. I see such progress in their lives! F, a now 24-year-old, is a refugee from Iran. He has been in the US a bit over two years. He supports himself by working at a restaurant. He’s going to junior college and applying to four-year schools. He has Obamacare and is healthy, and he’s plagued by the reassuringly normal, and heartbreakingly severe, insecurities of 20-something-year olds. My problem is appreciating how severe the “normal” insecurities are because I am so delighted with what he’s worrying about. S, now a 39-year-old asylee from Tunisia, has been in the US 2 1/2 years.. S is employed full-time at a job in San Francisco that has healthcare, vacation, and benefits. He is very concerned about the high cost of housing and living in San Francisco. I am so pleased those are his issues. Z, a refugee from Iraq has been in SF since 2013. He is now 30 years old, is working for a local furniture store, and recently was named employee of the month. Z has stable housing, too. A, a refugee from Iraq, has also been in country since 2013. He has stable housing and is getting needed dental care. He is worried about schooling. He is attending City College and maintaining a B average. T, from Uganda, recently was granted asylum and does not receive our financial support any more. A, from Russia, was granted asylum in late summer, 2014. He’s working 7 shifts a week in restaurants, has a relationship, rents a room in a shared flat, and needs no Guardian Group assistance. A is a 32-year-old asylum seeker from Nigeria who is entrepreneurial and professionally trained. He needs better housing while he waits for his date in immigration court. Our support for food, MUNI, cell phone, and other necessities help him. Junior from the Congo arrived as a refugee in November, 2014. He is graduating from job training, has stable housing for another five months, and enjoying his exploration of San Francisco. He receives the normal government benefits for newly-arrived refugees and doesn’t currently need our financial support. A from Tunisia has been in the US seeking asylum for approximately two months. He has free stable housing at the moment, and the Guardian Group is helping with other expenses. A is a professional, fluent in English, and very personable. J from Nigeria. I am not personally helping these men (other people in the Guardian Group are their primary contacts), but I hear that they are working through the legal/immigration process. Our support for food, MUNI, and other necessities help them. The longer-term Bay Area refugees and asylees are making their own way and struggling with “normal” problems. They are fun to be around, and I am grateful that most are remain in emotional contact with our group. We are using donated funds mainly to provide food, public transportation cards, cell phones, and other necessities to our asylum seekers who are not legally able to work. We also step in to help our low-income folks obtain dental care at UOP Dental School and to help with other extraordinary expenses. But, mainly, my contact with these young people is incredibly enjoyable. This entry was posted in Stories and tagged refugee status, status, status report, update on April 6, 2015 by Galen Workman.